This book presents a novel analysis of concealed-question constructions, reports of a mental attitude in which part of a sentence looks like a nominal complement (e.g. Eve's phone number in Adam knows Eve's phone number), but is interpreted as an indirect question (Adam knows what Eve's phone number is). Such constructions are puzzling in that they raise the question of how their meaning derives from their constituent parts. In particular, how a nominal complement (Eve's phone number), normally used to refer to an entity (e.g. Eve's actual phone number in Adam dialled Eve's phone number) ends up with a question-like meaning. 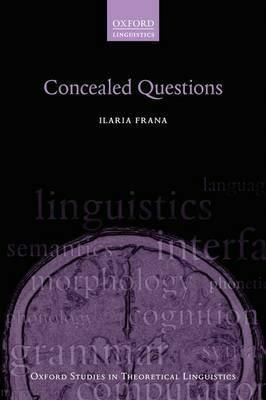 In this book, Ilaria Frana adopts a theory according to which noun phrases with concealed question meanings are analysed as individual concepts. The traditional individual concept theory is modified and applied to the phenomena discussed in the recent literature and some new problematic data. The end result is a fully compositional account of a wide range of concealed-question constructions.